Retired aerospace engineer, William Tompkins, has just given his most detailed account yet about the operations of secret space programs on the September 27 episode of Cosmic Disclosure. Many of Tompkins revelations corroborate the earlier testimony of the shows primary whistleblower, Corey Goode, who first publicly came forward in late 2014. After the War, Tompkins became directly involved in the development of a U.S. Navy secret space program called Solar Warden, where he provided the early draft designs for kilometers long spacecraft and non-terrestrial bases, while working at the Douglas Aircraft Company from 1951 to 1963. Solar Warden, according to Tompkins, became operational in the early 1980s. Tompkinss role in these space programs is supported by a number of documents provided in Selected by Extraterrestrials, and others provided in a March 2016 interview. In addition, FOIA documents have just been made available (to be described in an upcoming article), which confirm key details about Tompkins involvement in a Navy led espionage program aimed at infiltration of Nazi antigravity research projects during World War II. Tompkins revelations about the current operations of secret space programs derive from two periods in his life. First is his time at the helm of the Rogue Valley (Medford), Oregon chapter of the U.S. Navy League from 1985 to 1999. During this period, he was given briefings about operations of secret space programs and extraterrestrial life, and shared some of this information through a “Special Projects Committee”; with retired Navy, Marine and USAF officers and their children. Corroboration for Tompkins statements about the Navy League Special Projects Committee comes both from related documents and two retired Navy officers who confirmed key aspects of his testimony. 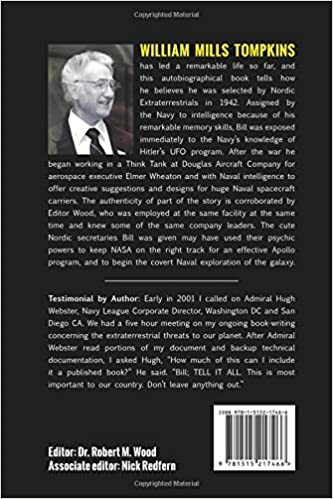 Furthermore, Tompkins says that Admiral Hugh Webster, who ran the U.S. Navy League chapter in San Diego and was an executive officer for it nationally, was initially briefed about the Navys secret space program by Tompkins in 1985. Webster subsequently began a similar operation in San Diego, and became part of the Navy’s covert operations. The second period in which Tompkins learned about the operational details of the Navys secret space program began in 2000, when he moved to San Diego, giving him more opportunities to work directly with Webster. It was Admiral Webster who gave Tompkins permission to write his autobiography and reveal all he knew about the Navys secret space program. Tompkins has further disclosed that he is a participant in the Navys annual West meetings in San Diego, where leading aerospace companies come together to share their research and development findings. Among the purposes of these meetings is the goal of finding the latest technologies that may be of use for the Navys secret space program. Tompkins says that he has attended all of these Navy West meetings since the year 2000, and plans to attend again in 2017 because he still has clearance to be present at classified meetings. Tompkins is currently 93, with a sharp mind, excellent memory and still physically healthy. It would be fair to say that he is considered to be a wise elder among those running current operations with the Navys secret space program. Given Tompkins background, and continuing involvement with the Navys Solar Warden program, his statements about its current operations bear special significance. Tompkins comments here are especially noteworthy. They corroborate the testimony of Goode, who asserted that there are thousands of personnel involved in the Navys secret space program. He and another alleged whistleblower, Randy Cramer, spoke of an operations center on the Moon called Lunar Operations Command, and both claim they were taken there in 1987 for their formal inductions. In the book, Insiders Reveal Secret Space Programs and Extraterrestrial Alliances, a chapter is devoted to a comparative study of the testimonies of Goode, Cramer and Relfe. Tompkins testimony adds a significant level of credibility to what each of these individuals had to say about how they were treated at the end of their secret space program 20 year tours of duty. We’ve got corporate operations operating parallel to missions to solar system planets and other stars’ planets, doing the same thing. Bill Tompkins detailed knowledge of current operations of the Navys secret space program, a corporate run program, and his willingness to now relate this information is a significant development for all who have been closely following his testimony. It is a major scoop for Cosmic Disclosure that Tompkins chose to reveal his knowledge there first, and it certainly helps substantiate the earlier testimony of Goode and others concerning Solar Warden and parallel secret space program operations. was someone that Roddenberry may have sought to emulate. Similarly, Admiral Stevens was known for his accomplishments in aeronautics and is quoted as having had a hand in the design or conception of all naval aircraft, aircraft carriers and carrier landing apparatus. Admiral Stevens aeronautics expertise meant that he was almost certainly aware of what Botta had learned about Nazi aerospace projects. William Tompkins confirmed, in a private phone call on August 24, that Admiral Stevens was aware of what the Navy had learned about Nazi Germanys flying saucer programs. He further confirmed that Admiral Stevens played a direct role in setting up a secret U.S. Navy space program, and that his son, Leslie Stevens, IV, was aware of what was happening. Tompkins claims here are consistent with what he says happened from 1985 to 1999, when he ran an extraterrestrial related Special Projects out of the U.S. Navy League center in Medford, Oregon. He said that it was common for Navy officers to have their children briefed about secret space programs and alliances with different extraterrestrial races. I met with a group of high level people in the military in the process  including the Undersecretary. According to John, the purpose of the plan  discussed in front of several military or retired military officers and former government officials was to help the Navy adjust their operations for a world in which it was commonly known that aliens exist and live among us. Tompkins testimony confirms that it was common practice for Navy officers, briefed about extraterrestrial life, to pass on some of this highly classified information to their children. Consequently, it is almost certain that Admiral Stevens revealed to his son, Leslie Stevens, some of the classified details about the existence of extraterrestrial life and secret space programs prior to his death. It is furthermore very possible, that Stevens, Jr., was part of a Navy sanctioned soft disclosure process that would use the television/movie industry to reveal elements of the Navys planned secret space program. Furthermore, it is topical to recognize that Roddenberry chose the beautiful, iconic city of San Francisco as the military headquarters for his fictional Starfleet Command in Star Trek, elevating this U.S. city in the hearts and minds of generations as a symbol of humanitys bright future achievements. It would also directly represent the Navys plan for its secret space program becoming a model for integrating other nations in a united partnership. Two independent sources, former Asian Bureau chief for Forbes Magazine, Benjamin Fulford in 2011, and an anonymous source called the Hidden Hand in 2009, have revealed that the Illuminati/Cabal specifically named San Francisco (along with Damascus) as a city that will be made uninhabitable in its Armageddon agenda. Does San Francisco pose a double threat as both a symbol of hope within the collective psyche, and the truth of a reality it mirrors in the militarys accomplishments? If so, then the Cabals goal is not to destroy a city, but to break the collective spirit of a peaceful human vision for a spacefaring future that begins with full disclosure. Rock star Tom DeLonge co-authored the book, Sekret Machines: Chasing Shadows, which is the first in a multimedia series of books and documentaries promising to blow the lid off a cover up of Secret Space Programs and the UFO phenomenon. A close reading of the “fiction based on fact” Sekret Machines, suggests that what it more accurately does is expose the reader to the first level of a multilayered set of Secret Space Programs. DeLonge, a former lead vocalist for Blink 182, is the creator of the Sekret Machines multimedia disclosure initiative, and has enlisted top writers such as A.J. Hartley and Peter Levenda to co-author up to six books. In the preface of Sekret Machines and interviews, Delonge describes how he is being helped by a team of ten advisors with direct links to corporations and Department of Defense entities involved with the U.S. development of a secret space program, and knowledge of a similar program simultaneously developed in Russia and the former Soviet Union. Sekret Machines is the product of what the advisory team is telling Delonge about their knowledge of the secret space programs that evolved in the US and Russia. According to DeLonge, their revelations are officially sanctioned by those with need to know access, and therefore the most authoritative disclosure yet to emerge on the topics of UFOs, extraterrestrial life and secret space programs. This leads to the all-important question: is what the advisory team telling DeLonge the full truth about these topics, or only the first layer of the proverbial onion when it comes to secret space programs involving U.S. corporations and different branches of the U.S. military? Delonge’s secret space program revelations in Sekret Machines need to be carefully compared to what credible sources have to say about these programs. In particular, the testimonies of whistleblowers who have publicly revealed themselves, thereby allowing close public scrutiny of their claims, provide a template for evaluating DeLonge’s revelations. There are two who stand out at the moment as the most credible independent sources of information on secret space programs: William Tompkins and Corey Goode. Tompkins, a former aerospace engineer, has provided multiple documents, some dating back to the early 1940’s, which support his claimed involvement in the development of U.S. Navy and corporate funded initiatives related to secret space programs. Tompkins says that he was involved in various stages in the design, engineering and construction of a secret space program called “Solar Warden,” up to the time it became operational in 1984. Two retired Navy officers recently confirmed Tompkins’ subsequent claims of leading “Special Projects” relating to advanced aerospace topics, while holding a number of leadership positions with the U.S. Navy League from 1985 to 1999. Goode has provided first hand testimony of direct involvement in the operations of these programs from 1987 to 2007, and more recently in negotiations between Solar Warden and other space related programs. While Goode has provided no documents to directly support his testimony, he has been extensively vetted by a number of sources. These include the managers of Gaia TV and best selling author David Wilcock, who found him to be credible and subsequently approved a series of interviews called Cosmic Disclosure, which just began its second year. My own analysis of Goode’s testimony in relation to other whistleblower revelations, public documents and circumstantial evidence was also positive, as detailed in the book, Insiders Reveal Secret Space Programs. What follows is a two part series of articles comparing DeLonge’s version of the history of a corporate funded U.S. secret space program, and what Tompkins and Goode have previously disclosed. In Sekret Machines, Delonge’s revelations coincide closely with the “high octane speculations” of the historian, Joseph Farrell, who has closely studied many Nazi-era documents in a series of books. We are told by DeLonge and Farrell that Nazi Germany was partly successful in developing an antigravity torsion field device called the Bell – Die Glocke. While it was not successfully weaponized in time to assist the Nazi war effort in Europe, it was secretly transported to South America, and eventually Antarctica in an effort by the Nazis to establish a covert Fourth Reich. The development of the Bell project continued at secret Nazi facilities funded by gold and corporate funds taken out of Germany by Deputy Fuhrer, Martin Bormann, which has been well documented by Paul Manning in the book, Bormann in Exile, and more recently by Farrell in The Third Way. In Sekret Machines, DeLonge describes how the Nazi Bell project was relocated to Antarctica after South American facilities were compromised by covert allied teams in 1946. The Nazi were able to develop several operational flying saucer craft in Antarctica that were capable of reaching incredible speeds and were highly maneuverable in the atmosphere. Operation Highjump, led by Admiral Richard Byrd, was successful in locating the Nazi bases in Antarctica in early 1947, according to Delonge. While Operation Highjump suffered casualties, it was able to destroy the Nazi facilities and flying saucer prototypes, and take back to the U.S. the recovered booty in terms of scientists, technical information, and resources related to the Nazi Bell research and development program. Subsequently, the breakaway Nazis no longer provided a significant military challenge to U.S. geopolitical dominance and secret research into antigravity craft using principles of torsion field physics. This is where DeLonge’s version of events in Antarctica and genesis of a U.S. secret space program diametrically differs with Tompkins and Goode’s revelations. According to the latter, Nazi Germany had two secret space programs that ran concurrently during WWII. The Bell experiments and research in Nazi occupied Europe was part of an unsuccessful “wonder weapons” program led by Heinrich Himmler’s SS that was under the direct control of the civil engineer and SS Lieutenant General, Hans Kammler. In Antarctica, in contrast, another secret space program was headed by German Secret Societies that had successfully developed advanced aerospace technologies with the help of two different extraterrestrial races. One was a group of human looking Nordics, while the other was a species of Reptilians called Draconians. While the Nordics were the first to help the German Secret Societies in the 1920’s by providing designs of antigravity spacecraft through mystics such as Maria Orsic, it was the Draconians in the 1930’s who ultimately became more influential with the Nazi regime and German Secret Societies. According to Tompkins, after agreements has been reached with Hitler, the Draconians provided actual working models of flying saucers, and information about underground bases in Antarctica where these models could be reverse engineered during World War II. Both Tompkins and Goode insist that the German Secret Space Program in Antarctica continued independently of what was happening in Europe under Kammler and the Nazi SS, which was essentially a second-tier weaponization program that was ultimately unsuccessful. At the same time, the first tier German Space Program located in Antarctica had succeeded in reverse engineering the flying saucer designs and prototypes they had acquired. The Germans subsequently began building fleets of antigravity vehicles capable of deep space missions to the Moon, Mars and beyond. According to Tompkins and Goode, the Reptilians had helped the Germans develop sophisticated weapons platforms for their Antarctica based spacecraft. The long term goal was that the armed German space craft would eventually join Reptilian interstellar fleets in galactic conflicts. Goode has described the German space fleet as the “Dark Fleet”, due to it being so highly classified that relatively little is known about it, even to the present day. Consequently, Operation Highjump was a dismal failure with the German flying saucers comprehensively destroying the Navy’s best fighter planes at the time. Tompkins and Goode’s version of events in Antarctica is supported by KGB files citing the ease with which the German flying saucers shot down the Navy aircraft. Byrd’s expedition returned empty handed, and with a powerful lesson that the Antarctica based Germans would be a powerful geo-political force for years to come. As mentioned earlier, this is a very different account of the Nazi presence in Antarctica to what is found in Sekret Machines. Why the discrepancy? For an answer we need to move on to the next major element in Sekret Machines – the secret development of the TR-3B “Locust” dual purpose antigravity aircraft and space craft.